This plugin is a dashboard widget to allow you to connect to any MySQL database of your choice (as long as your hosting allows) and search, edit, add and delete records in an easy to use interface. Ideal if you have built a site referencing another database. You can allow other editors/administrators of the site to alter, update, delete, add and correct entries without having to give them the full capabilities of administration tools such as phpMyAdmin. If you find this plug-in useful then please rate it, thanks. First you’ll need to enter the host (often localhost), the name of the database you wish to connect to and a valid user name and password. 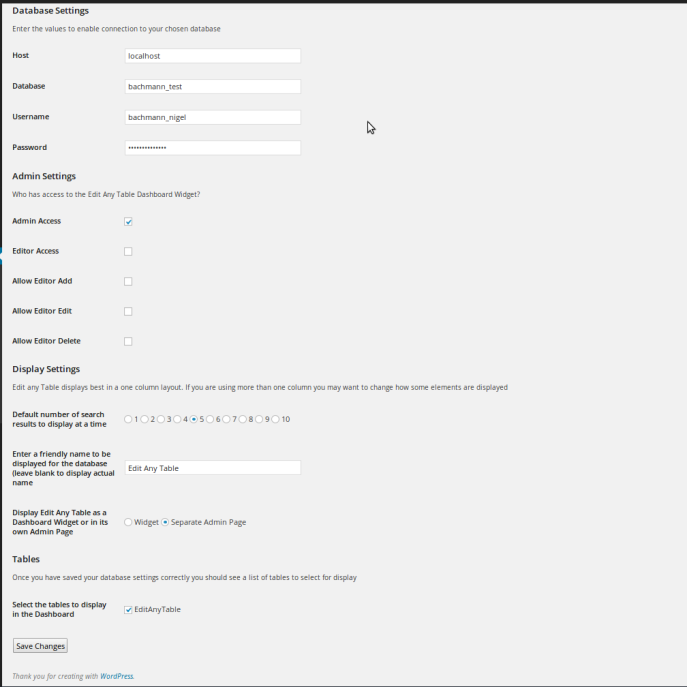 Under Admin Settings you can choose to allow Administrators only to have access to the widget or Editors as well. Note: If neither of these boxes are ticked the widget will not display in your WordPress Dashboard. You can choose what to allow the Editor to do i.e. Add, Edit and/or Delete. Leaving these boxes unchecked will give the Editor view only access. 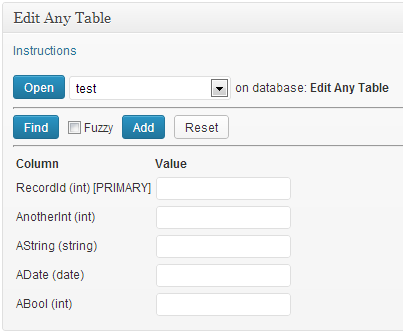 Display Settings allows you to select the maximum number of columns to display for returned searches. Edit Any Table displays best in a single column dashboard configuration and I find five columns is a comfortable fit but adjust to suit. Here you can also select to apply a friendly name for your connected database, this can help to assure editors (who don’t have access to the settings) they are working on the correct records. Finally, if you don’t want Edit Any Table to display as a widget then you can choose to have it rendered in its own separate admin page. 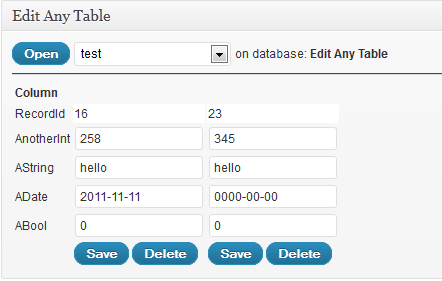 Tables, if you have entered your database credentials correctly and saved them, you will get a list of all the tables. Select which ones you would like to be accessed via the admin screen. You will also notice that at the top of the settings page is an option to switch debug mode on or off. Switching it on will display all the SQL sent to your database and may help identify and issues or strange results you may be getting. Now choose a table from the drop down list and select Open Note: If there is nothing in the list then you have either not entered the correct details in your settings or there are no tables in your database. Here you can either search or add a new record with the values you have entered. Entering no search criteria returns all the records from the table. To clear any values hit the Reset button. If you enter values that are not of the correct type or in the wrong format when adding a new record these values will be substituted for the database defaults. 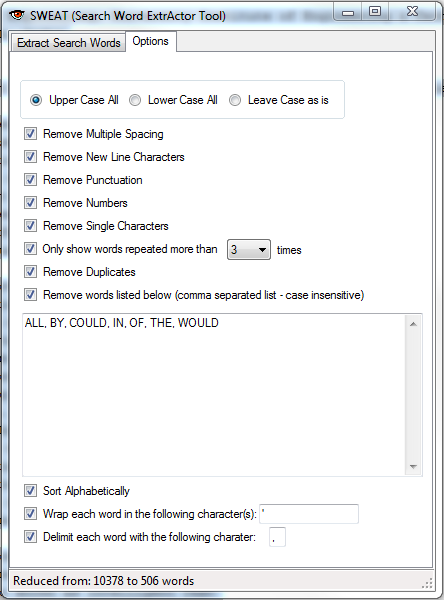 Wild cards do not work in searches but by selecting the ‘Fuzzy’ check box Edit Any Table will look for the phrase or part word you entered within any string field i.e. entering ‘Liz’ in a first name field could return Elizabeth, Liz or Lizzy. 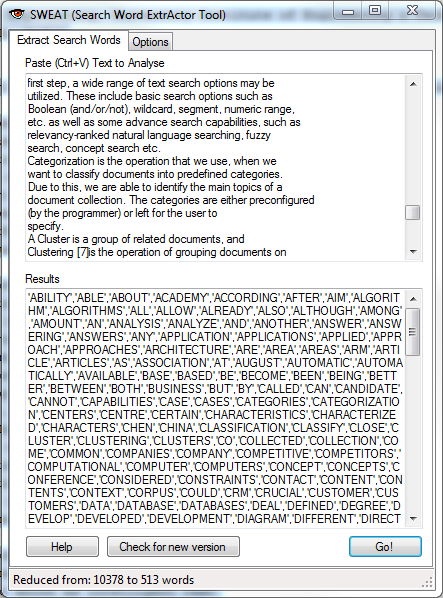 Please be aware that fuzzy searches can take a lot longer when searching large datasets. Any time you want to return to this screen just select the Open button again. Now you can edit the record contents or delete a record. To return to the search/add record screen just select Open again. That’s it, enjoy. 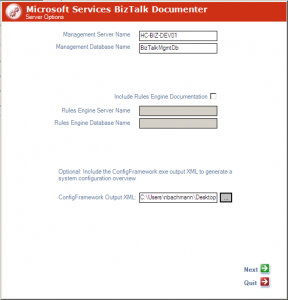 To use this plugin you need a basic knowledge of database design and setup. Modifying records can have unpredictable results so if you are at all unsure I would suggest creating a test table first before using in anger.